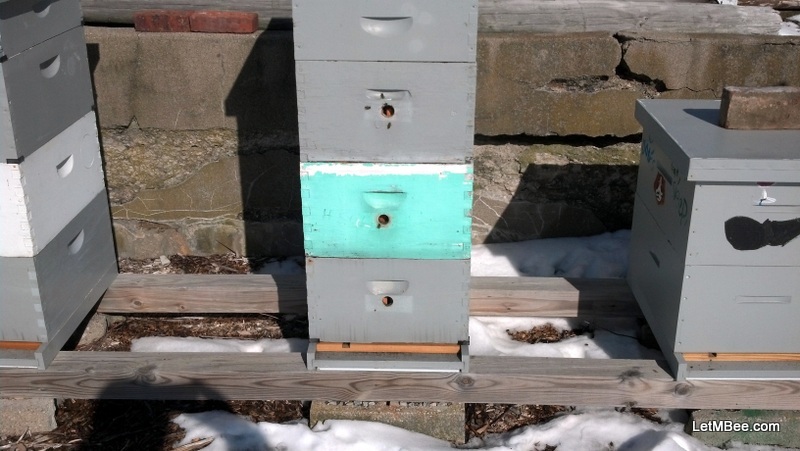 Checked in on three hives Thursday 2/7/13. They were observed at about 11:30. The outside temperature was 45 degrees F. There was activity from only one of the three colonies. A steady stream of bees came and went from 1005, but 1001 and 1208 were both absent of activity. 1001 and 1208 were strong going into winter. Is it time to mark them down as Goners? 1208 showing no activity on 2/7/13. I won’t discount the other two hives just yet. I have noted differences between hives in the early Spring before. 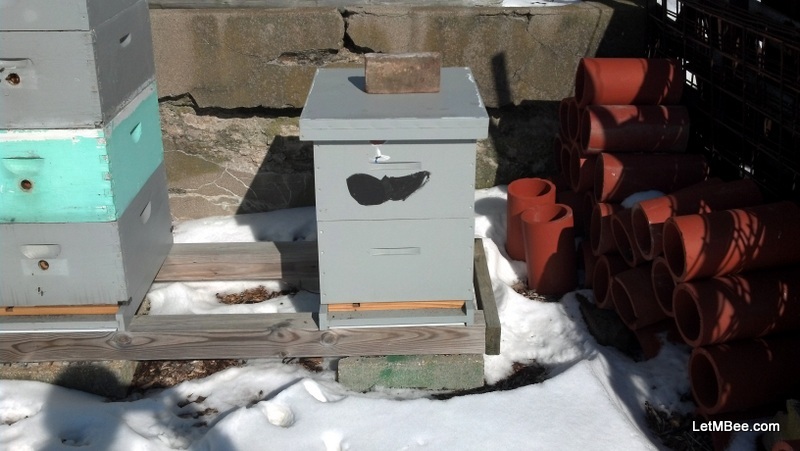 Some colonies will come out in low to mid 40’s while others refuse to leave the box until temperatures reach into the 50’s F. One such case was noted last year with hive 1101, which overwintered well, but showed no activity early on. Once March rolled around and the temperatures got a little higher they finally emerged. 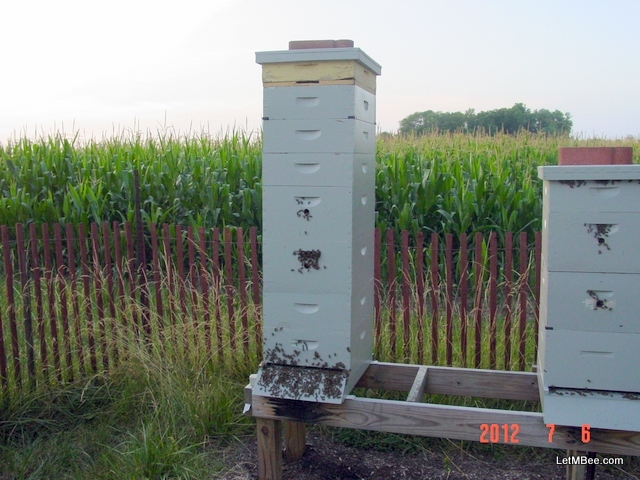 Hive 1101 on 7/6/2012. Showed no activity 1/5/12. 3/16/12 – Activity good, Removed attic box-25. The super that I left over the winter was still almost totally full of honey. Ultimate deep heavy, penultimate deep fairly light, bringing in pollen. Nadired 2 mediums under the two deeps. 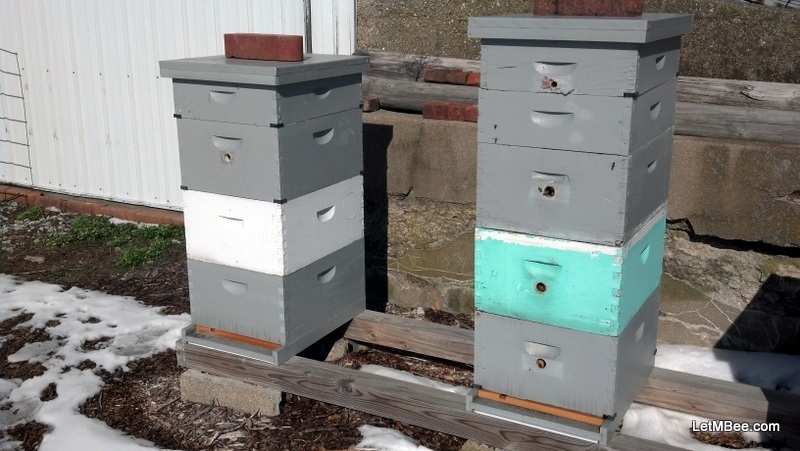 Placed two shallow supers on top alternating foundationless frames and drawn comb, the top super has 9 frames in it. Removed IPM-corrugated plastic – Varroa were present Mouse guard removed. 1001 (left) with no activity 2/7/13. I don’t want to stress my bees. They may not be ready to come out yet so, I will not check these hives until there is a sunny, warm, still day. I will have to wait until then to determine the fates of 1001 and 1208. Within the next 3 or 4 weeks all 30 of the hives will be needing that still warm day. Once the Spring inspections are completed I will post an update to the Obituaries link. I am hoping for the best, but there’s always a couple that don’t make it. Has anyone ever read or heard an adage, something like, “wax moths will not destroy your equipment while the trees are free of leaves”. At this point I can’t remember if I dreamt it or what, I thought I read it, but I cannot find it again. Am I losing my mind? maybe.. This entry was posted in Hive Reports, Posts, What's going on.. and tagged bee, beekeeping, Indiana Beekeeping, Overwintering. Bookmark the permalink.